For high quality, low cost airport transfers, look no further than On The Beach Transfers. On The Beach Transfers offers reliable shuttles and taxis for all your cheap airport transfers, to all your favourite holiday destinations, at the lowest prices available. Cheap airport transfers take the stress out of getting from the airport to your resort and back again, and will help to make your holiday as hassle free as possible! 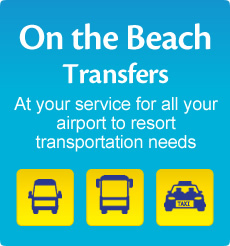 On The Beach Transfers offers unbeatable prices on airport transfer services. Our specialist transfers service is fast, reliable, and makes getting from the airport to your hotel - and from your hotel back to the airport - simple. We understand that the last thing you want to do after a flight is wait around for airport taxis or public transport - the quicker you get to your hotel or resort, the more time you get to relax and enjoy your holiday time! What's more, pre-booking your airport transfers means there's no chance of being faced with a hefty airport taxi bill, nor will you be squashed in an airport shuttle bus with dozens of other tired holidaymakers and their luggage. With On The Beach Transfers' easy to use service, you'll be picked up straight from the airport and driven in comfort and safety direct to the doorstep of your hotel. Then, when you're ready to leave, your driver will meet you at your hotel, help you with your luggage and drive you back to the airport. Remember, the earlier you book, the lower the prices - so book your cheap airport transfers with On The Beach Transfers today! On The Beach Transfers is a search website acting as a booking agent only.